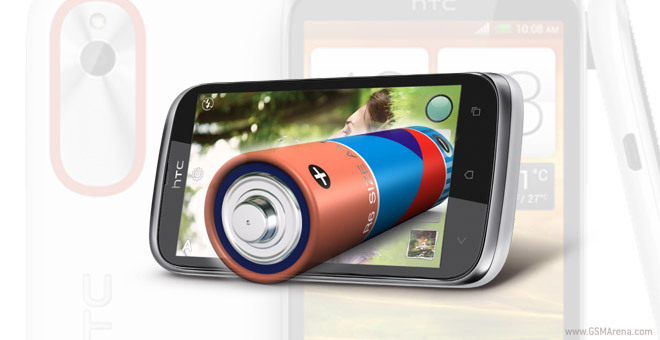 The HTC Desire V gets its juice from a standard for its kind 1650mAh Li-Ion battery, so you shouldn’t expect it to run circles around the heavyweight champions like the Samsung Galaxy Note II and the Motorola RAZR MAXX HD. Let’s start off with talk time, as its going to be the HTC Desire V’s main duty. It managed to clock the respectable 8 hours and 20 minutes utilizing one of its two SIM card slots. We’re only using one SIM slot so it can be compared easily to the results by other phones. Plus, when you have a call on one of the cards, the other will shut off for the duration of the call, so as regards to call time battery life one SIM does the job, too.The phone does, however, supports active dual SIM standby without a hiccup. Video playback is a little bit better and at 6 hours and 26 minutes is just a minute better than one of its main rivals, the Samsung Galaxy Ace Duos. 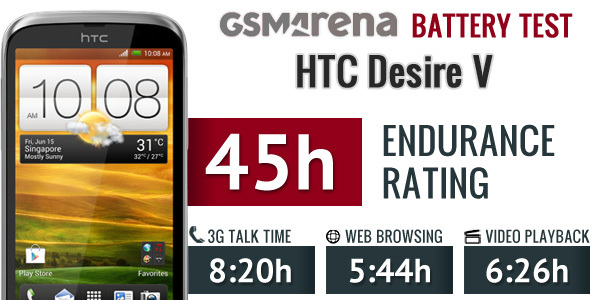 The endurance rating of the HTC Desire V came out as 45 hours. Assuming your usage is an hour of calling on a 3G network, browsing the web for another hour then watching an hour of video each day, you won’t need to charge the device for a hair under two days. For a dual-SIM smartphone not running the most power-efficient CPU out there, that’s fairly okay. Also, don’t miss out the full review of the HTC Desire V.